There are some travel destinations you visit for the sightseeing and some you visit simply for relaxation. Montreal falls into the latter category specifically as a city where you can relax, recharge, and tuck into some of the best food this side of the Atlantic. I had always heard about Montreal’s culinary traditions: France-centric with a dose of new immigrant authenticity. But I had no idea just how serious the dining scene was there. As I walked or biked the Boulevard Saint-Laurent – the main north/south boulevard – or ducked down its side streets, I saw countless cafés, delis, bistros, bakeries, banh mi sandwich shops, and markets, all of them seemingly packed – even on a Wednesday. My unscientific assessment was that there were approximately 3 eateries per capita in Montreal, about 85% of which looked worth visiting. My trip to Montreal was short – just two nights – but my husband and I made the most of the trip by making every meal count. Following is a recap of my fantastic food finds of Montreal. I recommend you visit this city immediately – especially before winter sets in! – and try a foodie tour of your own. Before I start, let me say that Foursquare was an awesome way for me to keep up with the places I visited while in Montreal (not to mention a fine way of remembering where I went when I finally sat down to write this article). Throughout this piece, I am going to link to the venues I went to on Foursquare so readers can view the sites on a map, tips, and more. You can also click on the Add to My Foursquare Button after each listing so you can add it to your own Foursquare to-do list. Give it a try! It’s important to whet your appetite before 48 hours of eating, so the first stop on our first evening was this slick, quayside outdoor bar just below the main streets of Vieux Montreal. An outdoor bar, you say? Indeed, it was the end of August and Montreal was just as hot and sticky as Washington, DC. Café des Eclusiers seemed to attract an equal amount of beautiful people and yipsters (yuppie hipsters – yep, I just made that up), but it didn’t seem to be particularly pretentious. Drinks were good, too. I ordered from the sangria menu. One of the reasons you go to Montreal is to have that “I’m in France, but not really” experience. So, you have to go to a French bistro-style establishment. We chose L’Express, a busy, buzzy place in the Plateau district and it was everything I could hope for and more: tiled floor; cherry wood bar; knowledgeable, attentive waiters and barmen who could have been straight out of the Marais; a din of clinking plates and happy conversations; a perfectly edited menu of bistro classics and seasonal dishes; and a wine list a mile long (though wine is pricey in Canada, unfortunately). I had the celery remoulade, the onglet de boeuf with frites, and a glass of syrah. Perfection. 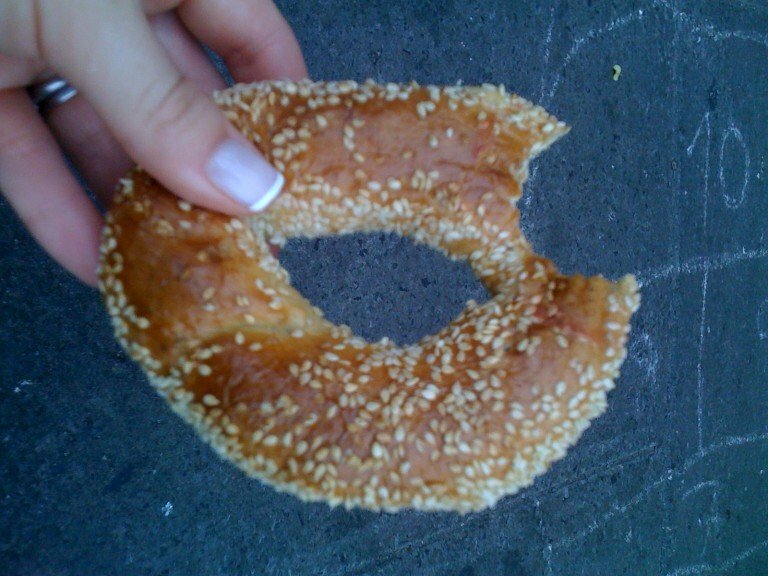 New Yorkers think they’re the only ones who can make good bagels, but I beg to differ. Our breakfast destination was Fairmount Bagels to pick up a fresh, hot, chewy Montreal-style bagel (see main photo above). Apparently the bagels are boiled in a honey water which lends them a slight sweetness. 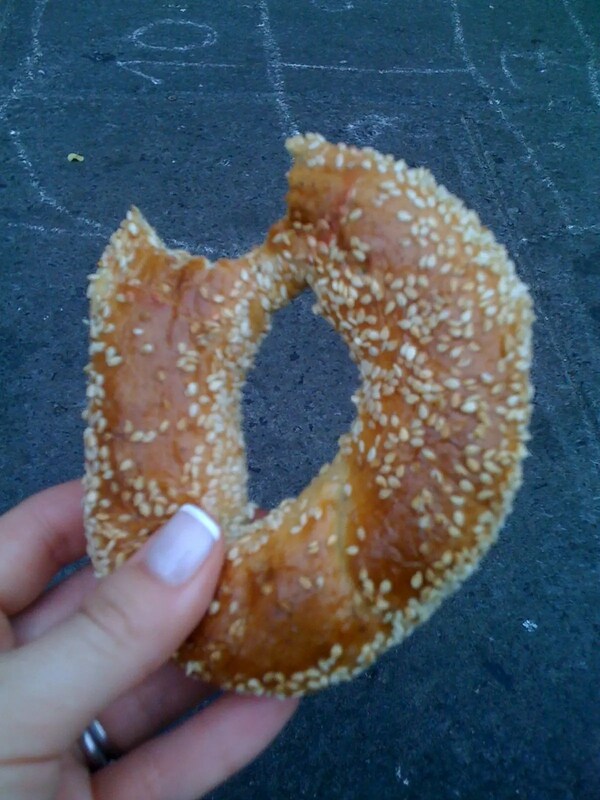 I found them to be an ideal hybrid between New York bagels and Turkish simits (which also have a sweetness, thanks to pekmez). Line up in the cramped store to get fresh bagels (of several varieties) or packaged bagels to take back home. There’s no eating inside, but the few cafés on the street were fine with us eating our bagels there – as long as we drank their coffee. 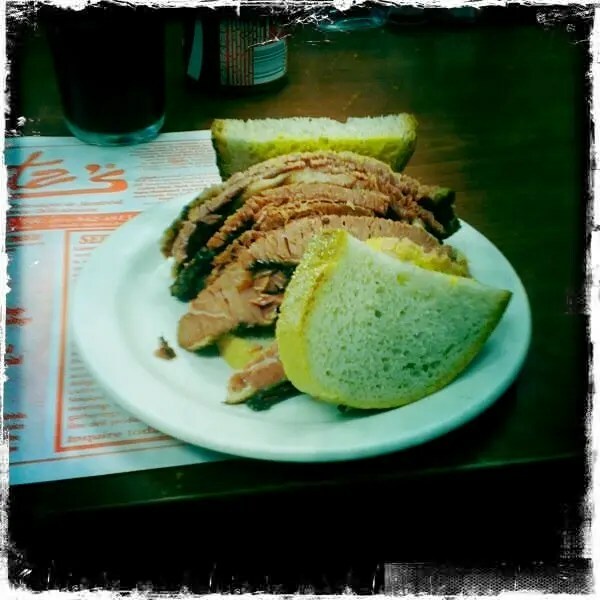 The lure of the smoked meat sandwich determined our lunch plans and the place to go was world-famous Schwartz’s Montreal Hebrew Deli, an institution right on Boulevard St. Laurent. We hit Schwartz’s around 2pm to avoid the lunch rush and still had to stand in line about 20 minutes. While waiting, we were able to check out dozens of slabs of smoked meat in the window, which was kind of like an overflow holding area for the kitchen. The line moved pretty fast and we were shown two stools at the bar. We ordered. Then, about five minutes later, a guy plopped down two regular smoked meat sandwiches, fries (one plate is enough for two), and a fat pickle, which we also shared. In case you’re wondering what smoked meat is, it kind of reminded me of brisket crossed with corned beef. I’m not sure. But it was great smothered in mustard. Our food jaunts around Montreal were made easier – and healthier – thanks to Bixi, a bike-share program. There are Bixi stands all around the city. Pay just $5 Canadian and you can have a bike for 24 hours. Swipe your credit card to get the code. The database remembers your information, so you can pick up and drop off a bike multiple times within a 24-hour period. We coasted down Boulevard Saint-Laurent on our bikes, all the way downtown to our hotel, where we could cool off and dress up before dinner. Drinks before dinner on the rooftop bar of Hotel Nelligan, one of the most talked-about boutique hotels in town which was unfortunately a bit too pricey for our budget. But the drinks were strong and delicious, and we enjoyed a lovely view of the sun setting behind the high rises of downtown. All that meat we had had in the previous 24 hours had been great, but our palates were craving something exotic and spicy. While I was advocating we go to Les Pyrenees, a good-looking Basque eatery (get it? We were in Quebec, another province with dreams of Independence), we ended up at Gandhi. Here was some of the best Indian food I had had since returning from there a few years ago. Sophisticated and bright flavors, not heavy like your typical Indian meal. Framed food section articles in the dining room signaled to us that this was a beloved alternative to Montreal’s typical carnivore menu. Our final morning was spent in Little Italy, which is also the location of the wonderful Marché Jean-Talon (more about this below). We stopped for breakfast in the originally named Caffe Italia, which looked from the street like a mob hangout. In fact, it was open, friendly, and served a delicious cappuccino and brioche with nutella. What else do you need to start your day? Our last stop before leaving Montreal was the great outdoor food market Marché Jean-Talon. There was a beautiful bounty of Quebec-grown produce as well as shops and stands lining the outside of the market that sold meat, fish, cheese, pastries. (See the slideshow below.) There was even a nice cookbook shop near the entrance. We may or may not have stocked up on contraband. Tech tip: As part of the Ile Sans Fils hotspot network, Marché Jean-Talon has free wifi! But the wifi requires a username and password. I recommend you signing up for Marché Jean-Talon’s free wifi service before you go to Montreal so you don’t have to spend time doing it once you get there. Great post! I love how you incorporated foursquare. Looks like Montreal has some fabulous eats. Delicious! I’ve never been to Montreal, but I’ve heard they do have an awesome food scene. That beef sandwich looks so tasty. And I love that they have a bike share system! More cities should do that.